This picture was taken two weeks before he died. 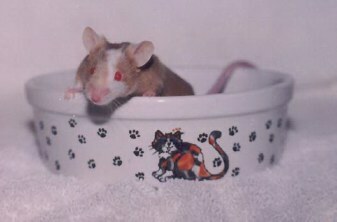 Dickory was my first mouse loss. It took months to mourn him. Dickory and Hickory had a huge 25 gal. bachelor pad. They got on well, and Dickory finished out his days here with me, instead of that tiny tank crammed full of mice. I do not regret buying Dickory and the boys, but I wouldn't do that now. But if it weren't for them, I wouldn't have the menagerie I have now. Dickory was always gentle--even when he had his goolies. I guess he learned a lot living in that pet shop tank. He was always very calm and he seemed wise. He passed this to Hickory, I think, in whatever way mice pass things from generation to generation. He never displayed aggression, or bit anyone, and he has the dubious honour of being the first rodent ever to piddle on my hand. I still miss him. My Old Man.